Black and white portrait photograph of the Di Ioia family in Italy in 1948. Pietro Di Ioia can be seen standing in the back row wearing a dark suit. His wife Maria Tartaglia Di Ioia is standing at his right wearing a black dress and rests her hand on the shoulder of their eldest son Giambattista Di Ioia. At the far left stands the eldest child Maria Teresa Di Ioia wearing a black dress. She wears her hair in two long braids and rests her hands on her younger brother's shoulders. 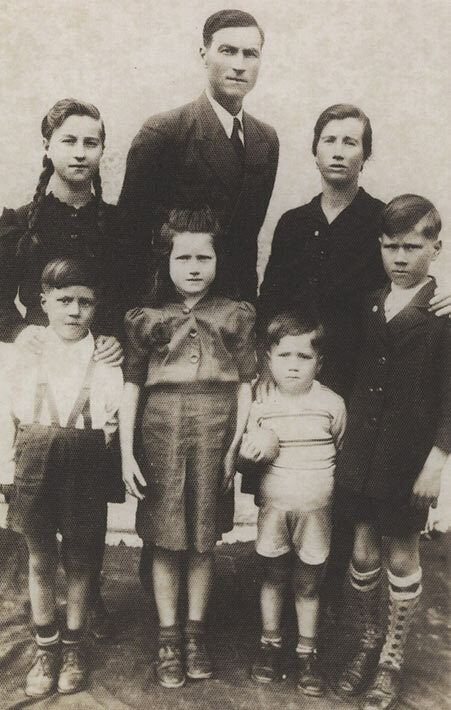 The three younger children in front are Antoinetta, Donato and Giuseppe. Pietro Di Ioia immigrated to Canada in 1950. He came on the ship the Vulcania which landed in Halifax on May 22, 1940. His immigration was sponsored by his cousin Francesco Di Ioia who had migrated to Canada in 1924. Francesco was arrested and interned by the Canadian government on June 10, 1940. He spent about one and a half years at the Petawawa Internment Camp before he was released. His wife Giuseppina Di Ioia was also briefly taken into custody during this period. After the war period Francesco was able to sponsor Pietro's immigration to Canada and secure a work contract for him with a farmer outside of Montreal. Pietro worked on this farm for a year before being hired by Cadbury Chocolate Co. in Montreal. The eldest son, Giambattista Di Ioia, was the first family member to join Pietro in Montreal. He immigrated to Canada on May 23, 1953 on the Vulcania, at 17 years of age. Maria Tartaglia Di Ioia and the three youngest children followed in December of 1953 travelling to Canada aboard the Conte Biancamano. The eldest child, Maria Teresa Di Ioia, did not join her family in Montreal. Rather she immigrated to New York City in 1953 on a student visa. She lived in New York until she immigrated to Canada in 1980.